Ok…I’ve been curious about this for a very long time. I recently saw a photo of a Sales Yearling who had that “checkerboard” design on it rump. 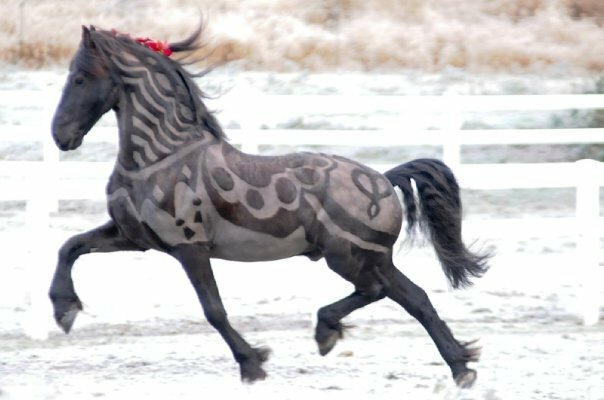 That reminded me of all the times I’ve seen that pattern on horses who are entered in a race. 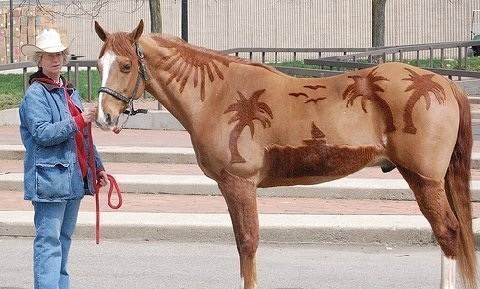 How is that design groomed onto the horse? I can’t tell you how many times I’ve seen horses in the walking ring with a braided mane and then the groom or jockey takes the rubber bands out leaving the horse with a curly “natural”. Is that intentional? The horse had its mane braided just to have the braids “undone” right before the race? Didn’t Affirmed race with braids? Coz looks like he’s had his hoofs polished with black hoof polish. I guess that’s not just for the sales ring? Casey, thank you for your comments! Loved hearing that some trainers, such as Doug O'Neil, do like the curly mane. And I have to agree, using that stencil sounds like a lot of work, but the look sure is fun. The jockey has to take the braids out of the bottom part of the mane. The jockey winds his/her fingers into the mane for security as the horse erupts from the starting gate. It's the only way to stay on during as the horse accelerates. I remember that movie...wasn't it Mickey Rooney instructing Alec in the scene? I always wondered if Mickey had some sort of "jockey" training for his roles. Him being in the Black Stallion and National Velvet with Liz Taylor and all. He's the right height for a jockey. No insult to him of course-he did some memorable movies! Mickey wasn't ever a jockey, but he played one both on the big screen and tv's Twilight Zone. I believe I remember that Twilight Zone episode... If I got my re-runs straight...he wanted to be taller like most people since he thought his career as a jockey was completely over (banned from racing for fixing races) and was frustrated from being bullied. He got his wish alright-woke up taller...but at the end, he received news that he his ban was lifted and he would be able to get a winning mount for the Kentucky Derby-something he always wanted...was extemely excited...but then realized that he was now too tall! Anyway...it was something like that that I recall of this TZ episode. Of course, I may be really off target. I noticed that and i am very sad but I don't think there's much we can do about it at this point? Markinsac makes his own decisions. If his main purpose for being in the forum was to get support for his view on the the management of TB racing and tracks, then he should have expected to face frustration as MANY of us out here just aren't into those issues. For me, it's just the horse stories (especially re Zenny and her kids) and actually 'talking' with all of you out there! I’ve noticed that most American trainers don’t cut the end of the tail off to be parallel to the ground like I see on horses trained in England. I think it gives a very polished and crisp look. ive seen some americans do that with their horses but not many. I think Michael Matz does that with his horses. I love the look of it. 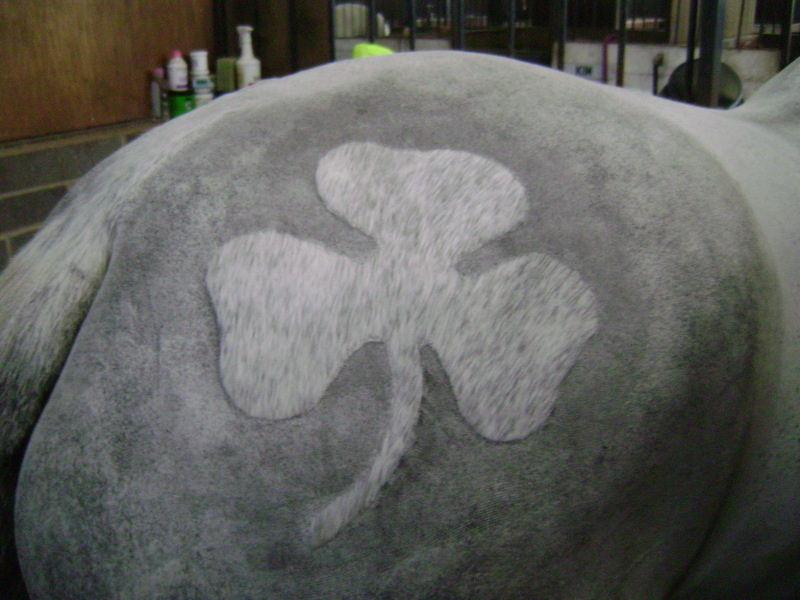 Trimming the edge of the tail is more popular in the Western and recently English show rings than it is in racing. 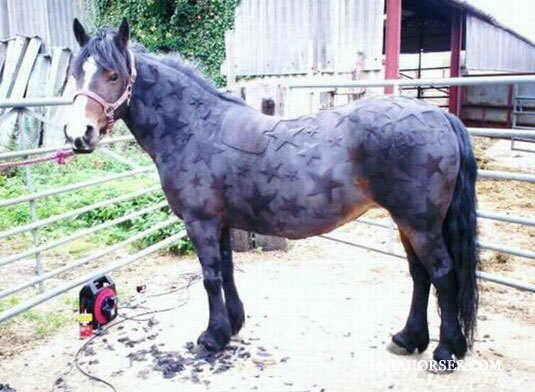 I agree with all of you though; it does give a nice polished look to the horse's tail. But I prefer natural manes and tails when horses are running. I'm surprised to hear it is popular in the Western show ring. Interesting. Regarding trimming the edge of the tail for the racehorse, I don't have a real preference. And we wouldn't have the nickname "Mr. Longtail" for Whirlaway if it were a standard practice. It's called "banging" the tail. 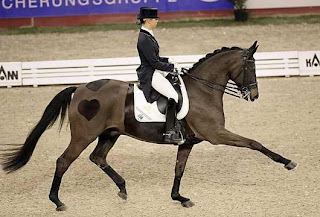 Dressage riders do it, because if the tail is too long, and they back up, they can step on the tail. There is a definite art to doing it right. You can't just chop it parallel to the ground when they're standing, because as soon as they start moving, the tail is held out and the cut will not be parallel. So you have to either put a polo wrap (rolled up) under the tail head, and then cut it parallel, or cut it at the angle of the hock. I always found the polo under the tail was easier. When is body clipping used...Summer or Winter or all year? It's done in the winter. Here's an article on the different cuts and why it's done. And here are some artistic clippings.